The bells of a church which have rung since 1779 are to be silenced after a noise complaint by a neighbour. 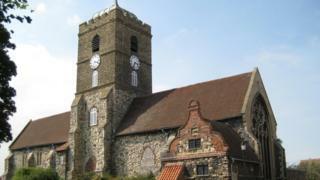 St Peter's Church in Sandwich, Kent, chimes every 15 minutes but Dover District Council served a night-time noise abatement order, despite 85% of the town's population objecting. Carole George, Save The Chimes campaign leader, said it threatened "traditions and history" in the medieval town. The council said it had a "statutory duty to investigate noise complaints". More than 3,500 people signed a petition to keep the bells in the Norman church ringing. The council's decision this week will silence the bells between 23:00 and 07:00 GMT. It comes after the complaint was made in the summer. Save The Chimes then surveyed people in the town and only 15% were indifferent to, or did not like the bells. Mrs George said: "This is not a democratic decision, the council has ignored the vast majority of its electorate. "The church has been ringing out for centuries, it's not a new noise. It's the beating heart of this town. "It is unclear what tampering with such an old mechanism will do, and there is a concern the bells may stop altogether." The council conceded the decision went against the majority, but said it had a "statutory duty to investigate noise complaints". The Churches Conservation Trust has 90 days to make the changes. A spokeswoman said: "We do not have the funds or resources to facilitate an appeal. "We have told the local campaigning group if we receive a clear mandate from the community that they will fundraise to cover the costs, we will take it forward." South Thanet MP Craig Mackinlay said he would "fight to get common sense to prevail". The noise complainant has been contacted for a comment.